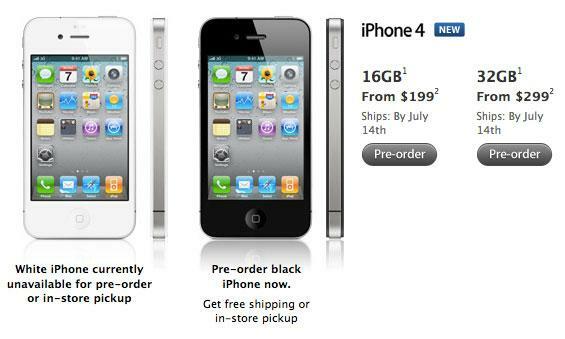 Shipping dates for iPhone 4 slipped for the second time in less than 24 hours Wednesday, as preorders for both the 16GB and 32GB models are now scheduled to ship by July 14. The delay means that some customers may not receive their handset until nearly a month after it launches on June 24, when shipping time is considered. Earlier Wednesday, Apple moved back new iPhone 4 orders, promising they would ship by July 2. Those orders were scheduled to be delivered between July 6 and July 8, meaning customers could have to wait as long as two weeks after the June 24 launch to receive their iPhone. Assuming the same shipping time, orders sent out on July 14 would not likely arrive until around Monday, July 19. That would be 25 days —or nearly four weeks —after the June 24 launch. Apple announced that more than 600,000 devices were preordered on the first day of iPhone 4 availability. The Cupertino, Calif., company also took the opportunity to apologize to customers who encountered difficulties in placing their preorder. Both Apple and AT&T, its exclusive wireless carrier in the U.S., experienced issues, as AT&T's servers struggled to verify eligibility for some existing customers, and Apple was forced to turn away callers to its toll-free telephone number. Orders through AT&T are no longer an option for U.S. customers, as the wireless carrier announced Wednesday that it was suspending preorders due to demand ten times higher than for the iPhone 3GS. The company said it has temporarily suspended preorders so it can fulfill the orders it has already received, and the availability of additional inventory will determine whether they will resume taking preorders. Preorders remain limited to the black iPhone 4 model, as the white version is listed as currently unavailable for purchase. Third-party retailers such as Best Buy have also halted preorders of the white model.